Cystinosis is an autosomal recessive disease caused by a mutation in CTNS, which encodes the lysosomal transporter of cystine. Without this, cystine gradually accumulates in cells causing progressive damage. The commonest kind is “nephropathic cystinosis” which is the juvenile form and presents in infancy although there are milder adolescent and adult forms. It is a rare disease with only 6,000 sufferers worldwide. It is characterized by the early development of fanconi syndrome with progressive loss of tubular function leading to ESRD by the age of 10. Most affected children are blond and have marked growth retardation. 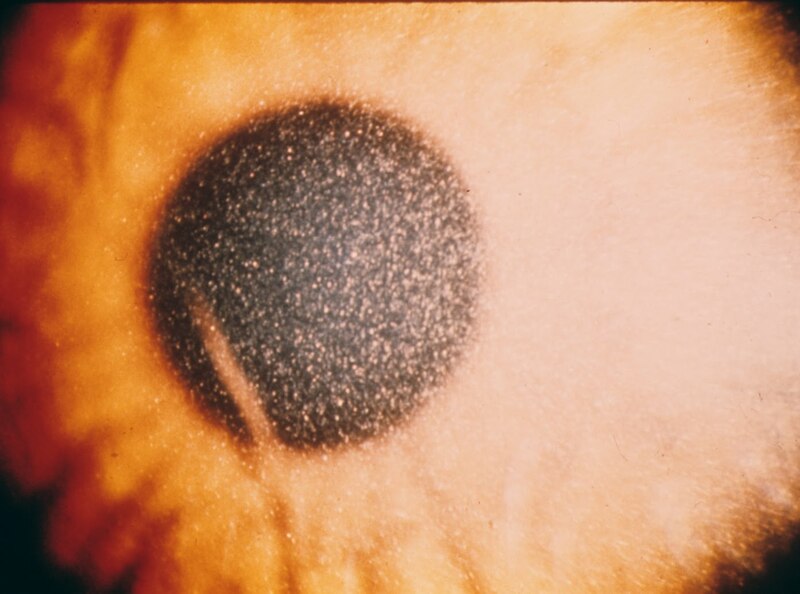 Corneal deposits are common and can cause blindness later in life. Patients may also have hepatosplenomegaly, muscle weakness, delayed puberty and eventual neurological disease. The adult form is more benign and usually presents with visual problems although it can lead to ESRD in some patients. There is an effective treatment for cystinosis – cysteamine, given orally, enters the lysosomes and reacts with cystine forming a complex that can exit the lysosome and prevent build-up. It should be started as soon as the disease is diagnosed but even with this, the tubular defects often persist. However, there is a definite improvement in overall renal prognosis with this drug. So, if there is an effective treatment, why do many children with this disease still go on to require renal transplantation? There are huge issues surrounding compliance with the medication. It needs to be taken four times daily at equal intervals. More importantly, it causes severe halitosis and body odor that, for a young child, can be devastating. I had a patient a number of years ago who told me that he and his brother had to be removed from class because the problems with bad odors while on the drug and that he preferred going on dialysis and getting a transplant than remaining on the treatment. Unfortunately, at that time, he was developing severe visual problems related to build-up of cystine in his corneas. There may be some more light at the end of the tunnel. Recently, phase III trials were completed on a new formulation of cysteamine. This can be given twice daily, has a lower total cumulative dose than the standard formulation and appears to cause less halitosis and body odor. According to the company, 40 of 41 patients enrolled in the study decided to continue the drug after the phase III period had ended. This is certainly encouraging. 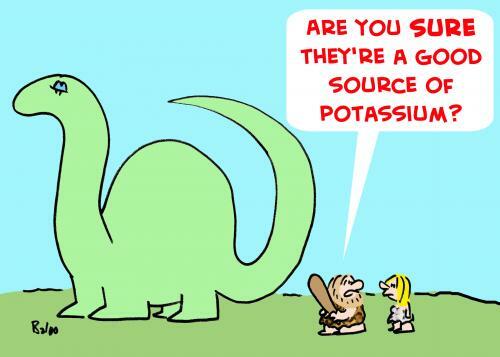 As Nate mentioned previously, this should not be confused with cystinuria, a disease of amino acid transport in the kidney leading to an increased susceptibility to kidney stones. We are facing a conundrum in post-transplant lipid management after the recent warning from the FDA, which updated the label of simvastatin. This drug is now contraindicated in patients taking cyclosporine due to the potential for liver dysfunction and myopathy. Just to remind you, statins are metabolized by the hepatic cytochrome P450 3A4, similarly to calcineurin inhibitors and mTOR inhibitors. In the presence of these immunosuppressive agents, statin levels are raised and risk of myopathy is increased. This danger has always existed, however, the FDA has taken a harder stance lately with creating a “contraindication”. Moreover, simvastatin doses greater than 20 mg/day are also not recommended anymore in patients receiving amlodipine, which is the vast majority of transplant recipients (this is new since prior literature solely reported non-dihydropyridine CCB like diltiazem and verapamil as important interactions). Nonetheless, there is nothing listed when simvastatin is co-administered with tacrolimus, sirolimus and/or everolimus. However, the potential for a similar drug-interaction and adverse events exists. So what do we do? First, let’s do a brief review of dyslipidemia post-transplantation. Elevated cholesterol levels are very prevalent in transplant recipients reaching above 80% of kidney recipients in some reports. Immunosuppressive drugs play a major role, with all the following classes glucocorticoids, calcineurin inhibitors (cyclosporine greater than tacrolimus) and mTOR inhibitors having deleterious effects. Among them, the effect of mTOR inhibitors is different since it causes predominantly elevated hypertriglycerides due to blockade of insulin-stimulated lipoprotein lipase. The importance of dyslipidemia in the transplant population is related to the most common cause of death with a functioning allograft - cardiovascular disease (~40%). Similar to the dialysis data, statin trials in transplantation are limited to one prospective randomized trial (ALERT) with fluvastatin in kidney transplant recipients that showed lower cholesterol levels in the treatment arm compared to placebo, however there was only a non-significant trend towards reduction of composite cardiovascular events. Nonetheless, secondary outcomes of this trial, observational, long-term follow ups and post-hoc analyses have suggested some beneficial effects. Most of our transplant patients are taking tacrolimus which is extensively metabolized by the cytochrome P450 family enzymes in the liver and excreted into the bile. Therefore, what should we do? Should we stop completely using simvastatin? I think there is no straight answer here, especially since we have been using statins for a long time in combination with tacrolimus, monitoring in those settings LFTs and symptoms of myalgia. But now with the formal contraindication with cyclosporine, physicians will get more careful in prescribing even the sister CNI with simvastatin. Insurers will likely change their policies facilitating the use of other statins as well. So which statins are safe to use? Fluvastatin and Pravastatin (both generic) have minimal drug interaction with CNIs/amlodipine and should be considered for mild hypercholesterolemia, since both are weaker statins (see strength and interconversion table above that I simplified from the FDA version). Atorvastatin should be the chosen statin for moderate-severe hypercholesterolemia, since it has increased potency requiring a lower dose and has a favorable safety profile despite some metabolism by P450. Rosuvastatin, a novel potent statin, could also be the agent of choice since it is not metabolized by cytochrome P450, though preliminary results from the PLANET trials have reported a higher risk of proteinuria when higher doses were administered. Therefore, it is wise to wait until final results are published. The debate is open and would love to hear how others would face this dilemma. 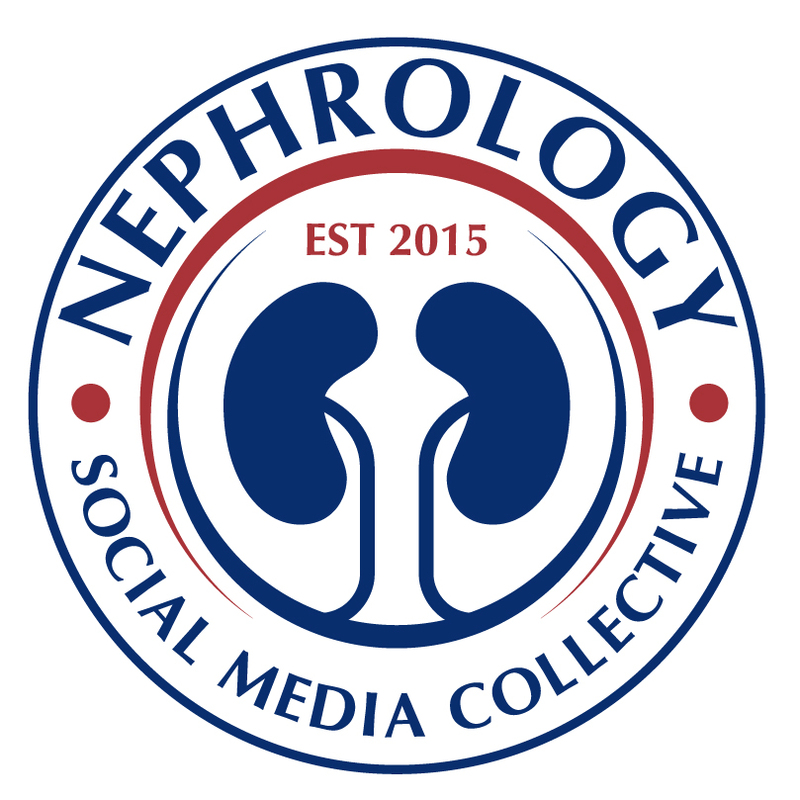 Early in 2009 Nate posted on work suggesting that renal tubular epithelial cells had the ability to repopulate the renal tubular epithelium after ischemia reperfusion injury. 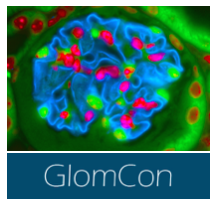 Since then, some amazing work has been done on what have been termed glomerular epithelial stem cells. Podocytes, unlike glomerular mesangial and endothelial cells, cannot divide. 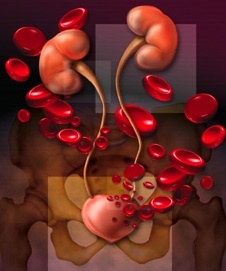 However, there are a number of clinical situations such as the spontaneous remission of proteinuria in patients with membranous nephropathy and the remission of diabetic nephropathy after pancreatic transplantation that suggest that podocyte repair or perhaps even replacement via stem cells is possible. To be termed a stem cell a cell must be capable of self renewal (the ability to go through numerous cycles of cell division while maintaining an undifferentiated state) and be able to differentiate into various specialized cell types. Along these lines, an Italian group was able to identify candidate renal stem cells by using the cell surface markers CD133 and CD24 which are found on other adult stem cells elsewhere in the body. These cells initially were shown to be both capable of self renewal and generation of mature, functional, tubular cells with phenotypic features of proximal and distal tubules. In addition, given the right conditions these CD133 CD24 positive cells were able to become osteogenic cells, adipocytes, and cells that exhibited phenotypic and functional features of neuronal cells. These renal stem cells are located in the urinary pole of the parietal epithelium of Bowman's capsule. In later experiments they were shown to be able to become not only renal tubular cells but also podocytes. In the figure on the upper left from an excellent review written by the Italian group the exquisite organization of these cells is shown. The glomerular epithelial stem cells are shown in red at the urinary pole. 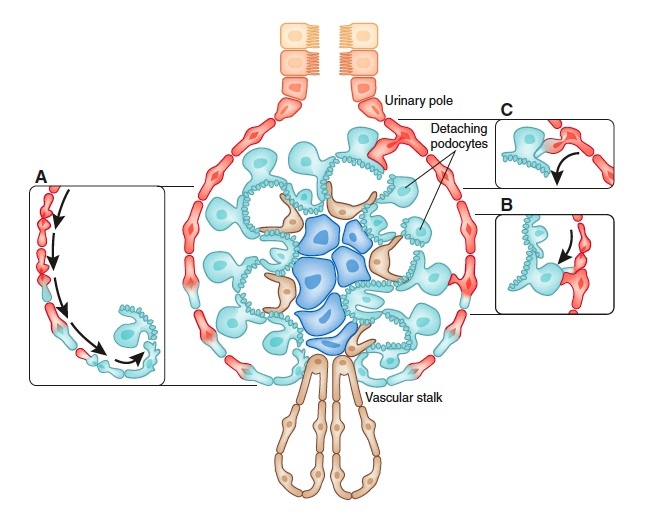 A transitional cell population of podocyte progenitors closer to the vascular stalk, is colored both red and light blue. These progenitors differentiate only toward the podocyte lineage and lack the properties of self-renewal. The light blue cells in the vascular stalk and glomerular tuft express only podocyte markers and the phenotypic features of differentiated podocytes. 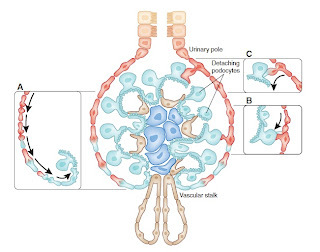 Suggested mechanisms of podocyte replacement are also shown with A) progressive differentiation down Bowman's capsule to the vascular stalk B) direct bridging by adjacent progenitor cells C) bridging by glomerular epithelial stem cells that subsequently acquire podocyte markers. Excitingly, injections of these renal stem cells appear to attenuate proteinuria and histologic damage in experimental animal models of FSGS and renal dysfunction in experimental animal models of rhabdomyolysis. It's amazing how much has transpired since Nate's last post and hopefully, this science will help us move toward a better understanding glomerular disease and ultimately more effective treatments for our patients. Last year, Matt wrote a great post detailing the preliminary results of a randomized, controlled trial that had been presented at the ASN in November. 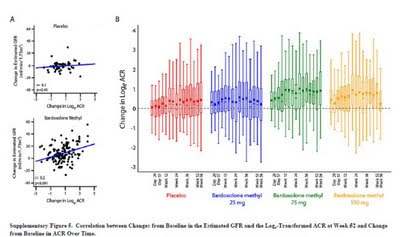 It was reported that the anti-inflammatory modulator, Bardoxolone, significantly increased eGFR, in a dose-dependent manner, in type 2 diabetics treated for 24 weeks. The final results of the trial were published in June in the New England Journal of Medicine. 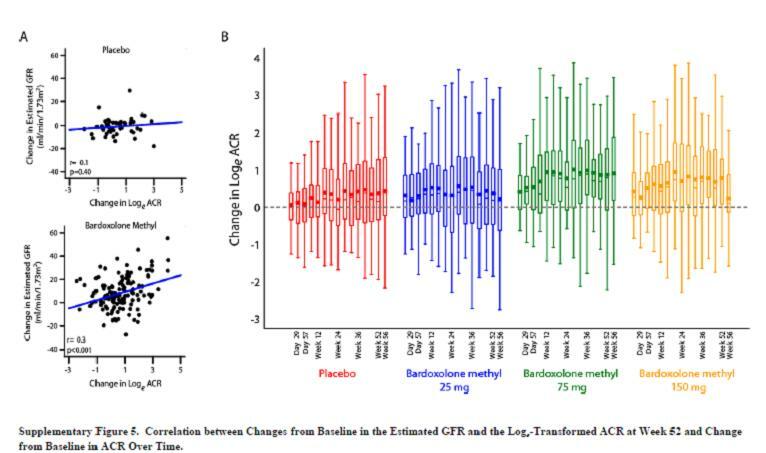 The authors found that treatment with 25, 50 and 75mg of bardoxolone was associated with increases in eGFR of 5.8, 10.5 and 9.3 ml/1.73m2 respectively. The increase in eGFR persisted 4 weeks after stopping the drug. The authors suggest that this increase in eGFR is due to the anti-oxidant and anti-inflammatory effects of the drug although the mechanism is not entirely certain at this time. Overall, the drug was well tolerated with the most common side-effects being dose-related muscle cramps, mild elevations in transaminases and hypomagnesemia. Although this appears to be very promising, there are a number of questions that I have about this study. The use of eGFR as a primary endpoint is questionable. 98% of the patients in this study were on an ACE/ARB and, as Matt alluded to in his previous post, if you took all of these patients off the ACE/ARB, you would probably see an increase in GFR. This is not necessarily a good thing if, in fact, it is simply leading to increased intraglomerular pressure. In the paper, the authors state that the drug is similar in structure to the cycloprostenone prostaglandins. Although these are described as being primarily anti-inflammatory in nature, could they also cause afferent arteriolar vasodilatation and therefore have a significant hemodynamic effect? The authors point out that the effects persisted up to 4 weeks after stopping the drug which suggests that the effect is not entirely hemodynamic but does not exclude it. It is important to note that this increase does not appear to be related to changes in creatinine metabolism. In a prior, smaller study, the same authors reported increases in measured creatinine clearance in patients treated with the drug without any change in overall creatinine excretion. I am open to correction but I take this to mean that the ACR was 1.4 times baseline in the placebo group but that this increased to 2.6 times baseline in the 75mg group. This was highly significant. The figure below, also from the appendix, tells a similar story but it must be pointed out that the scale on the left is a log scale such that any increase may appear less than it actually was. In a study of the progression of diabetic nephropathy, I would have imagined that the change in the ACR would be an important endpoint and would have been included more prominently. 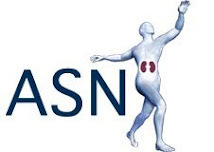 All that said, the result of this study matches with animal data that suggested a protective effect for this drug in models of acute and chronic renal disease and if the increase in GFR is real and beneficial, this class of medications could revolutionize the treatment of CKD. It’s great to see potential new lines of therapy for our patients and we should look forward to the phase III trials that will apparently begin enrolling later this year. Dihydropyridine (DHP) calcium channel blockers are notoriously associated with dependent oedema, but what mechanisms underlie the pathogenesis of this finding? Here are some explanations from a nice review I came across. Going back to Starling’s forces governing the formation of interstitial fluid – net capillary fluid filtration is influenced by hydrostatic pressure, oncotic pressure, capillary permeability and lymphatic drainage. Upon change in posture from lying to standing, hydrostatic pressure in the vessels of the lower extremities increases. However, this is held in check by autoregulatory mechanisms which cause protective vasoconstriction via local sympathetic reflexes and myogenic reflexes – the latter are caused by smooth muscle contractions in response to increased vessel transmural pressure. These myogenic reflexes are mediated in part by L-type DHP sensitive calcium channels. 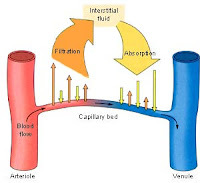 They allow calcium influx, causing pre-capillary smooth muscle constriction, thereby reducing hydrostatic pressure in the capillary bed – the final result is guarding against increased interstitial fluid accumulation. DHP calcium channel blockers can prevent the entry of calcium to smooth muscle cells, preventing this protective pre-capillary vasoconstriction, facilitating the formation of dependent oedema. In patients with already impaired autoregulation (e.g. diabetics) calcium blockers may be associated with more profound leg oedema than others. Of course, there are likely other factors at play, including increased capillary permeability and other local neurohormonal influences. Last time we reviewed the proposed mechanisms by which hypercalcaemia can induce polyuria. It’s important to know that hypokalaemia can also precipitate this presentation. So here are the proposed mechanisms for this scenario. Potassium is required for the thick ascending limb NaKCl2 co-transporter to operate. Remember that potassium is recycled via the apical ROMK channel, which facilitates ongoing sodium reabsorption in the TAL and maintenance of the medullary concentration gradient. Therefore, potassium deficiency may lead to concentrating defects via this pathway, leading to polyuria. There is also some evidence that hypokalaemia leads to impaired responsiveness to ADH. The exact mechanism is unclear, but obviously decreased responsiveness to ADH may lead to large volumes of dilute urine. Other interesting nuggets with hypokalaemia – movement of potassium out of cells in the proximal tubule (in the setting of hypokalaemia) is balanced by inward movement of hydrogen ions. The creation of an intracellular acidosis increases ammonia production by the proximal tubular cells, which may exacerbate problems in patients with decompensated liver disease. Chronic potassium depletion (over a month at least) in humans can cause the development of vacuolar lesions in renal epithelial cells, primarily in the proximal tubule. If the deficiency persists over a longer time period, changes including interstitial nephritis, tubular atrophy and medullary cyst formation have been described. Potential mechanisms underlying these changes may be related to altered growth factor and cytokine production, or ammonia accumulation. This collection of findings has loosely been referred to as hypokalaemic nephropathy. The use of the protocol transplant biopsy is a divisive topic: some units see a protocol program as necessary for proper management post-transplantation, whilst others deride the whole concept as unnecessary. So who is right? Protocol biopsies are taken at predefined intervals after transplantation regardless of kidney function. Their use is based on the theoretical benefit of detecting acute rejection, chronic allograft injury, calcineurin inhibitor (CnI) toxicity, recurrent primary disease & BK virus infiltration where the presence of these diagnoses is not evident by a measurable decline in allograft function. Most work to date has focused on sub-clinical rejection. I detect two relevant questions here: is sub-clinical rejection sufficiently common to be an issue and is detection and treatment beneficial? In answer to the first point; the KDIGO guidelines list seven studies (on pg S31) which have looked at prevalence of sub-clinical rejection providing estimates of 13-25% at 1-2 weeks, 11-43% at 1-2 months, 3-31% at 2-3 months and 4-50% at 1 year. A number of studies have shown that sub-clinical rejection is associated with reduced graft survival and chronic allograft injury and that treatment of sub-clinical rejection may improve long-term graft outcomes. However, the majority of these studies have been performed with cyclosporine (CsA) and azathioprine (Aza) maintenance regimes. As a result, perhaps most relevant to current practice is an RCT that randomized 240 patients on tacrolimus & MMF to biopsies at 0,1,2,3,6 months or 0 & 6 months. Rejection rates were generally low with clinical episodes seen in 10% of biopsy arm patients and 7% in the control arm. Additionally, sub-clinical rejection was seen in only 4.6% of the biopsy arm and creatinine clearance at 6 months was identical between the two groups. So, perhaps not surprisingly, KDIGO feels only able to state that 'based on very-low-quality evidence, the benefit of performing protocol biopsies in CsA/Aza patients without induction therapy may outweigh the harm' (pg S32). This strikes me as a vanishingly small proportion of incident transplants. Taking this together with the fact that the KDIGO authors could find NO data showing a benefit in detecting sub-clinical CnI toxicity, recurrent disease, BK nephropathy etc, I would suggest that perhaps the protocol biopsy has had its day. Recently at our biopsy conference we had the case of a healthy middle aged man presented who had come to medical attention with episodes of painless gross hematuria. He had consistent rbcs on UAs, normal renal imaging, a serum creatinine of 1.1 mg/dl, 360 mg per day of proteinuria and unremarkable serologies. An extensive urologic evaluation had been unrevealing and a kidney biopsy was normal. When the usual suspects of urologic and glomerular causes of relatively isolated hematuria (IgA nephropathy, Thin Basement Membrane Disease, Alport's Syndrome) are not around you sometimes have to go a bit deeper down the differential diagnostic list. Along those lines RFN has had a couple of posts on some of the more unusual painful causes of hematuria including renal infarction, Loin Pain-Hematuria Syndrome and the Nutcracker Syndrome (also covered on PBF). As mentioned, our patients hematuria was painless. He had no history of diabetes, NSAID use, infection or obstruction to implicate renal papillary necrosis. There was no travel history to suggest Schistosoma haematobium or Tuberculosis. His ethnicity made Sickle cell unlikely. He only exercised as much as the average first year renal fellow (ie not much) so exercise hematuria seemed out. The room was a little stumped. A metabolic possibility that came up after conference was hypercalciuria and or hyperuricosuria in the absence of nephrolithiasis. In a small series of patients without nephrolithiasis and with persistent microscopic hematuria in the setting of normal renal function, urinary protein excretion and renal imaging published in KI, hypercalciuria was defined as greater than 4 mg/kg/day and hyperuricosuria was defined as greater than 800 mg/day in men and greater than 750 mg/day in women. 37 patients were identified who fit the above description and had hypercalciuria, hyperuricosuria or both. 43% of them reported having episodes of gross hematuria in addition to their known microscopic hematuria. The authors went on to treat the entire group with HCTZ and or allopurinol with the goal of normalizing urinary calcium and uric acid excretion which was achieved in all patients. Hematuria completely resolved in 59.4% of cases. In the discussion the authors speculated that perhaps microlithiasis was the cause of the hematuria in some of their cases. Of the patients who did not respond to lowering of urinary calcium and uric acid they all persisted with microscopic hematuria and at about a year followup a reasonable alternate cause (IgA nephropathy, Thin Basement Membrane Disease ect) was ultimately found or strongly suspected in all but four cases. Another small case series of 12 similar patients in familial clusters was subsequently published in AJKD. Here again 30% had reported episodes of gross hematuria in addition to microscopic hematuria and all patients were able to normalize their urinary calcium and uric acid excretion through medication and dietary measures. All 12 patients were able to achieve resolution of their hematuria. We were recently consulted on a patient with a history of repeated admissions with pneumonia who had developed AKI following treatment with Tobramycin. It got me thinking about the mechanisms of aminoglycoside toxicity. The traditional teaching is that aminoglycosides are best administered in once daily doses in order to reduce toxicity but given the fact that this should lead to higher peak levels, it seems counterintuitive that this might prevent nephrotoxicity. However, this makes sense when you understand how aminoglycosides damage the kidneys. Aminoglycosides are freely filtered at the glomerulus. 90% of the drug is excreted unchanged in the urine while the rest is reabsorbed in the proximal tubule. As Nate mentioned in a previous post, they bind to phospholipids in the cell membranes in the S1 and S2 segments of the proximal tubule. During ischemic episodes, there is some uptake in the S3 segment also. They are subsequently endocytosed via the transmembrane protein, megalin, and accumulate in the cytosol where they mediate their toxicity. The degree of renal damage associated with the various aminoglycosides is related to the ability of the drug to bind to these phospholipids. The more binding that occurs, the more nephrotoxicity. Gentamicin is the most toxic, followed by tobramycin, amikacin and streptomycin. The reason why once daily dosing is better is that this transport mechanism is saturatable and beyond a certain concentration, no more drug is taken up. Thus, peak levels correlate with bactericidal ability while trough levels correlate with renal (and oto-) toxicity. Interestingly, this is similar to the mechanism of renal toxicity associated with imipenem. There have been efforts to develop a drug that could be co-administered with aminoglycosides that would inhibit their transport in the proximal tubule and thus prevent their nephrotoxic effects, but unfortunately none have been successful. Gentamicin is made up of four components and when these are administered separately, it turns out that one of them, C2, does not appear to be absorbed as readily into the proximal tubular cells while still retaining the bactericidal ability of the whole drug. This may have potential for reducing nephrotocity in patients who are particularly at risk – i.e. pre-existing AKI or ischemia.